Quiet racism and why our work is so important. LONDON — Disparaging reactions to Prince Harry’s relationship with actress Meghan Markle have highlighted the racism and class snobbery that persist in British society. The American will become the first person who identifies as biracial to join the upper echelons of the U.K.’s royal family when she marries Harry in May. But some black women said coverage of the Los Angeles native’s roots by some media outlets is indicative of the underlying racism that they experience daily. said Paula Akpan, a co-founder of Black Girl Festival which celebrates black British women. Read the full story. Quiet and overt racism against black women in Europe is a problem which is why our work is so important. 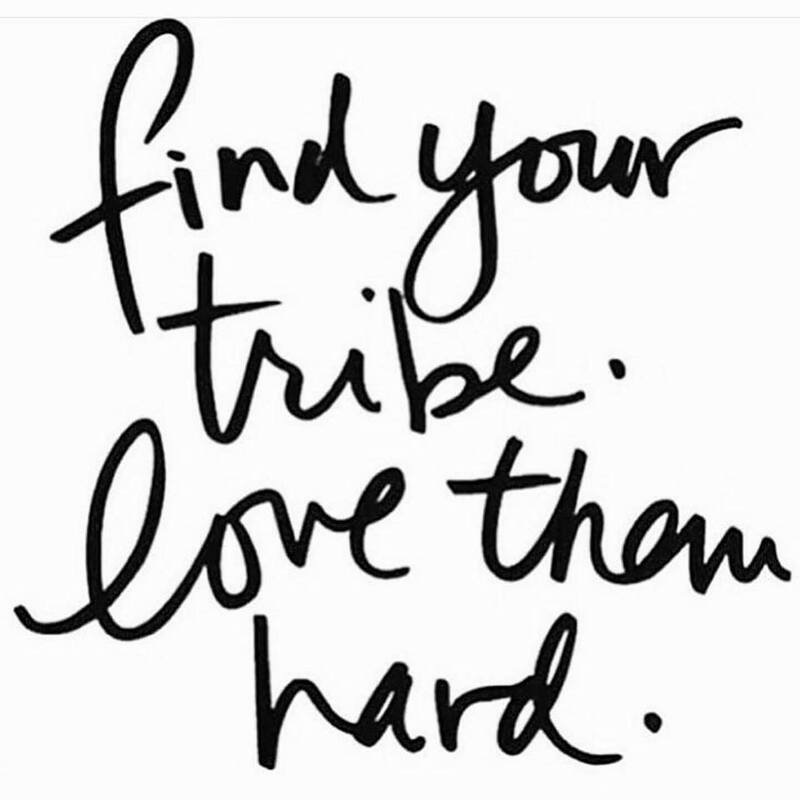 Help us build the most comprehensive directory of organizations in the UK and across Europe that support black women. Submit the names to contact@bwiesmg.org today. The Black Women in Europe™ Social Media Group held its 2017 Annual General Meeting yesterday. Board members in Copenhagen, Denmark, Gothenburg, Stockholm, Sweden and New York, USA met via Skype and telephone. Of the 8 members of the Board, one was in Stockholm protesting the slavery of African immigrants in Libya and another was being interviewed by German state television and were unable to attend. 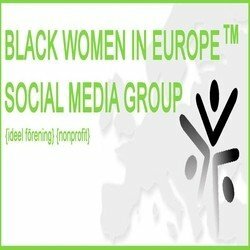 All persons who completely accept and support the statutes of our association are welcome to become members of the Black Women in Europe™ Social Media Group. Scholarships can only be awarded to Members who are black women living in Europe. For these purposes, a black woman is defined as having direct African descent. Membership fees and donations will be used to cover the costs of executing and maintaining the three pillars of the organization. Board members unable to attend the full meeting were offered a Proxy to submit their vote. 3 votes were submitted by Proxy. Award-winning writer and photographer Lola (Akinmade) Åkerström has photographed and dispatched from roughly 60 countries for various publications. Her photography is represented by National Geographic Creative. Her work has appeared in National Geographic Traveler, BBC, CNN, The Guardian, Travel + Leisure, Slate, Travel Channel, Lonely Planet, Fodor’s, National Geographic Channel, several in-flight magazines, amongst others. She was in South Africa on a photography assignment for National Geographic Channel and was featured in a vignette called “Through The Lens” which airs on Nat Geo channel across the globe. She also owns and runs Geotraveler Media – a multimedia and travel consulting firm providing a spectrum of travel media-related services from writing and photography to web design and social media. She is editor-in-chief of Slow Travel Stockholm – an editorial site which encourages travelers to explore Stockholm deeper and slowly. She is also a founding member of the Nordic Travel Bloggers (NordicTB) collective which brings together the top professional travel influencers and digital storytellers in the Nordic countries of Sweden, Finland, Norway, Denmark, and Iceland. Kathy Thompson is a former classical, neo-contemporary and modern professional dancer. Amsterdam (Scapino). She performed with the Basel Ballet, Switzerland, Cie Nomads, Vevey, Switzerland, Phillip Trehét, LeHarv, France, Pretty Ugly, Freiburg, Germany, and Dortmund Stadtheater, Germany. After dancing in various productions in Berlin she re-educated herself, moved to Stockholm and worked for foot specialists Scholls where she honed her skills before opening her own salon. Kathy is a foot therapist, lymph massör and Alexandria Body Sugaring hair removal practitioner and Educator. It is not by accident that Kathy is able to use her innate ability to be in tune with the body and mind to bring healing and beauty together in a professional setting in Stockholm city. A native of Gambia, Daphne Norman-Sandberg has called Sweden home since she was two years old. After earning a Business Administration degree from the University of Gothenburg Daphne spent 24 years as a Social Worker and Human Resources Champion fighting to prevent sexual violence against women and children. She was an advisor to the Swedish Delegation to the UN Commission for the Elimination of Discrimination Again Women in 2010. She is the proud mother of 3, grandmother of 1 and foster mother to over 40 children from various backgrounds. Somehow, she has found the time to fuel her love of travel. In addition to her monthly trips to the UK to visit the Gambian community, her travels have included visits to Sri Lanka, Malaysia, Poland, Iceland and all 3 Baltic States. We are compiling the largest and most comprehensive directory of organizations in Europe that support black women. You can help build our directory. Send submissions to contact@bwiesmg.org. Adrianne George has won many awards for her work in the blogosphere including the Maishagalen Entrepreneur of the Year. She is a sought after speaker with past engagements in San Francisco, Amsterdam, and London. 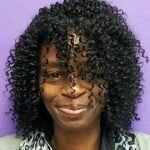 Her 10-year old multi-award winning Black Women in Europe™ Blog received media credentials from the Democratic Party to cover 2012 Democratic National Convention. She was part of an accredited blogging team in 2008. In 2005 she founded JobsinStockholm.com which at the time was a ground-breaking job board for English speakers in Sweden. She is the co-founder of the Women of the African Diaspora website and social network, BlackExpat.com website, and StockholmExpat.com blog. She is a founding board member of the Black European Women’s Network in Vienna, that received recognition from the European Commission. Lesley-Ann Brown is a Trinidadian-American author, freelance journalist, activist and poet. Her recent work examines methods of decolonial narratives fused with political activism. She´s one of the co-founders of Say It Loud, a spoken-word-poetry collective, consisting of Black women poets in Copenhagen, Denmark. Say It Loud is now the R.A.M. Poetry collective (Random Access Memory). Brown has been featured and invited to participate in a range of events, including BE.BOP 2016 Black Europe Body Politics, in Berlin and Copenhagen, and she was one of the panelists in and organizers for the first ever Women of Color Panel in Denmark . Brown attended the New School for Social Research’s Eugene Lang College where she studied Writing & Literature. She later went on to work in New York publishing while freelancing for various magazines. Her move to Copenhagen, Denmark in 1999 inspired her to create the blog www.blackgirlonmars.com – which she has since retired. She´s currently working on a memoir entitled ‘Decolonial Daughter’, to be published in the UK in Spring, 2018 by Repeater Books. Jonas Lind is a career Military Officer with over 35 years of service to Sweden. During his career he has moved from the Platoon, Company, Brigade and Joint Staff levels on Gotland, Halmstad, Stockholm, and England. He has been a popular instructor, mentor, and lecturer and is an avid reader and visitor of historic sights. He brings his unique Swedish perspective, level-headedness, and talent for forward thinking to our Board. It is official! 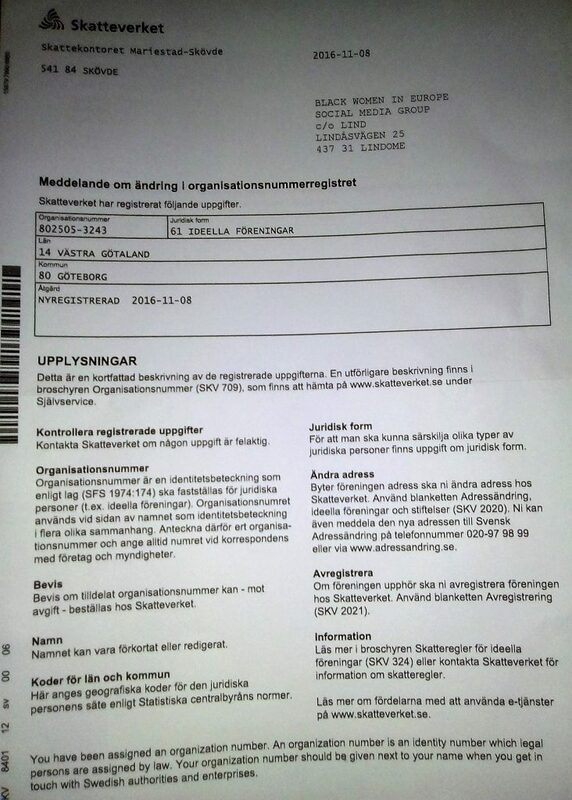 We are a recognized non-profit, known as ideel förening, in Sweden. Black Women in Europe™Social Media Group registration paperwork. Special thank you to Irene Opira for her insight, keen eye, and above all the time she dedicated to ensuring that our paperwork was correct. More thanks to our entire Board for taking the necessary time required to hash through, section by section to guarantee our Statutes reflect our values and goals.